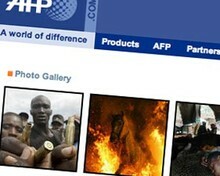 Agence France Presse (AFP) has banned its journalists from using Facebook and Wikipedia as sources, the agency's London bureau chief told a Lord's Committee yesterday. In response to a question from the Lord's Committee on Media Ownership and the News about the trustworthiness of online sources, Pierre Lesourd said that internal rules that governed the entire organisation prevented journalists from relying on many new 'virtual' sources for news. "We have internal rules that are regularly updated [on this matter]. Wikipedia for example, we have a written rule inside the company that forbids any journalist using Wikipedia," he said. "We have the same thing, updated last week, for Facebook because of the incident with Bilawal Bhutto in Oxford. "Some newspapers picked up pictures on Facebook about Mr Bhutto, which turned out to be fake. "We are trying to be vigilant about it but, obviously, everyday a new virtual source appears. We have to be very careful." Speaking to Journalim.co.uk today, Mr Lesourd clarified the policy, stating that reporters working for the international agency could not pick up information from these sites for news without referring to other, more reliable sources for factual clarification.